We made it as far as Minden without mishap, but the weather forecast for the next day made us a bit nervous. 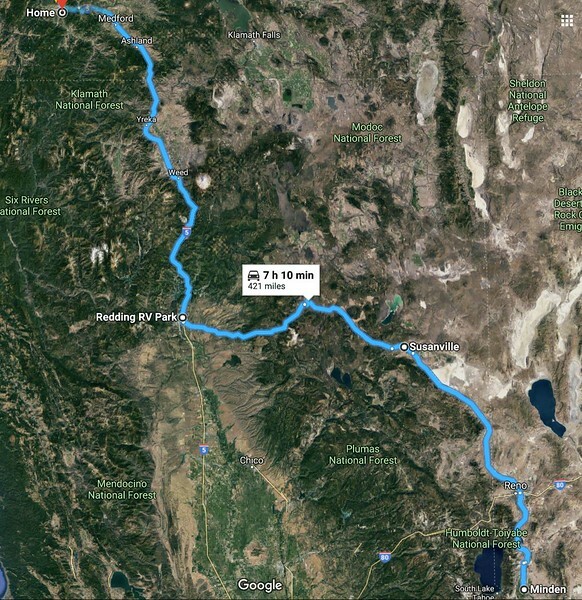 Should we scrap our plans for continuing north all the way to Susanville and then over the mountains to Mt Shasta? 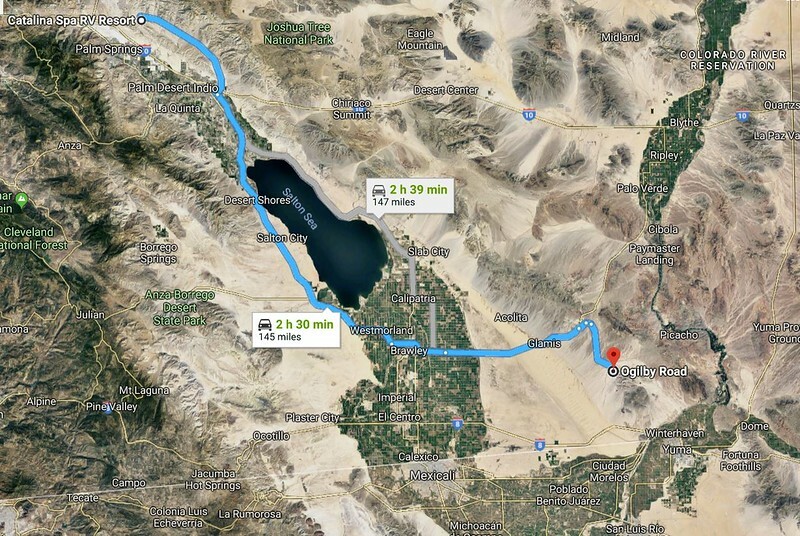 Or should we just give up and travel west from Reno on I-80 over Donner Pass and then home, again, on I-5? 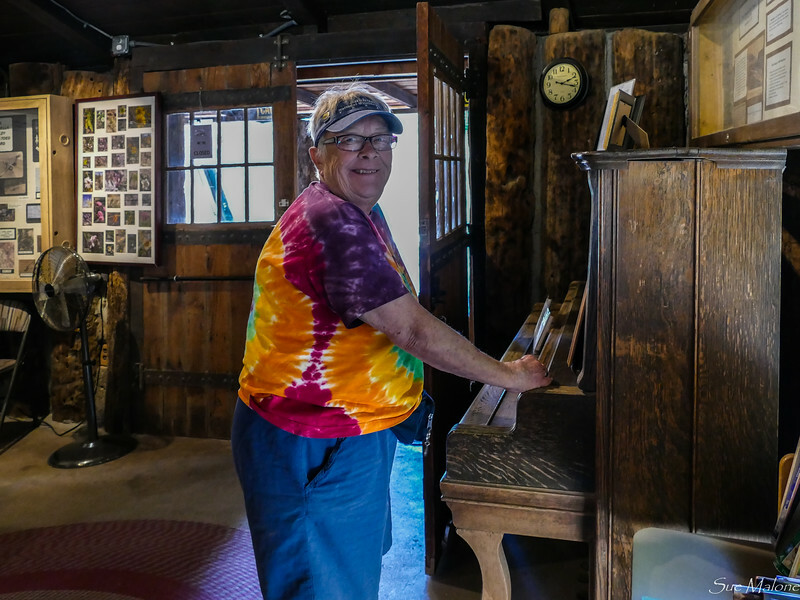 If we had traveled the 5, we may have been able to get up the hill to visit Jimmy and Nicky, but we also had the “horse to the barn” thing going after being away 3 weeks. We were ready to be home, and the visiting desires were waning. I decided instead to make a special trip next month for visiting, and will include my friend Maryruth on that visit. I seem to enjoy it much better when the visit is dedicated to actual visiting instead of traveling. We looked at the weather, I checked all the road cams, watched the radar. 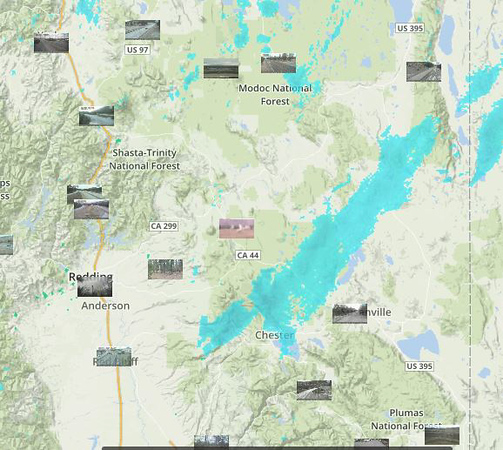 Everything looks almost OK until Susanville, when the blue streak over the mountains to the west indicated snow. Still, that blue streak was moving east, and maybe it would pass us by as we headed north and west. We decided to take our chances, and figured that even if we couldn’t get across 89 up to Mt Shasta, we could no doubt manage 44 across to Redding. Highway 44 meanders along the north side of Mt Lassen, and except for a very few twisty places, is a fairly good road. 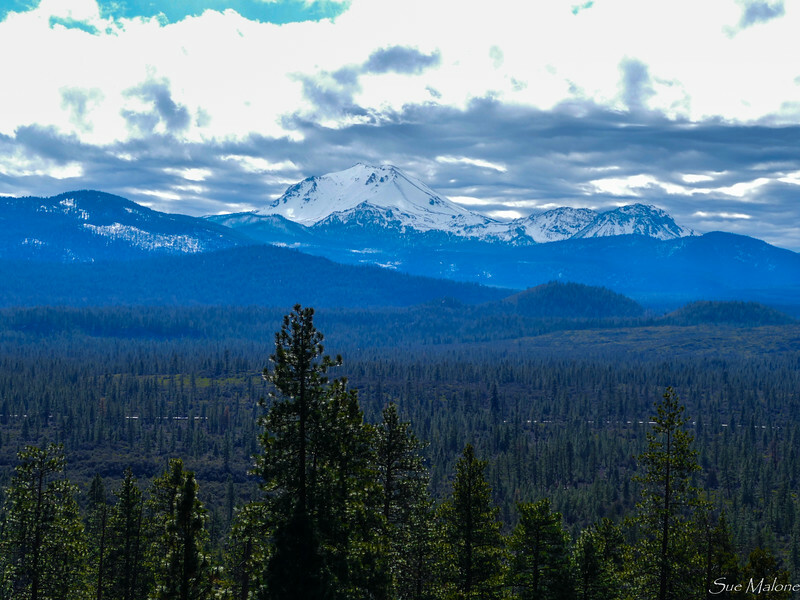 It had been a few years since we traveled that route, when we hiked some fabulous trails in Mt Lassen and returned to Klamath Falls via Susanville. 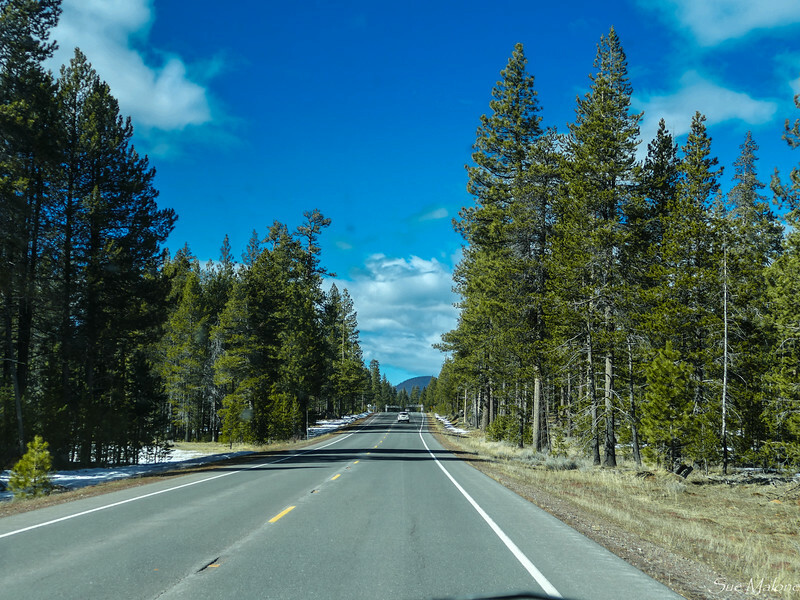 We were right about the snow, and encountered a few flurries along Highway 395 before we arrived in Susanville, but by the time we continued west on 44, the snow was gone. The highway was clear and we were even treated to some great views of Mt Lassen. Even though we were fairly close to home, when we arrived in Redding we decided to slow it down a bit, get a place to park for another cold night, and travel the last 4 hours to home in the morning when we were fresh. In addition, that would put us at home mid day, much nicer than crawling into our driveway in the dark. Another happy little reason for taking our time in Redding had to do with Valentine’s Day. 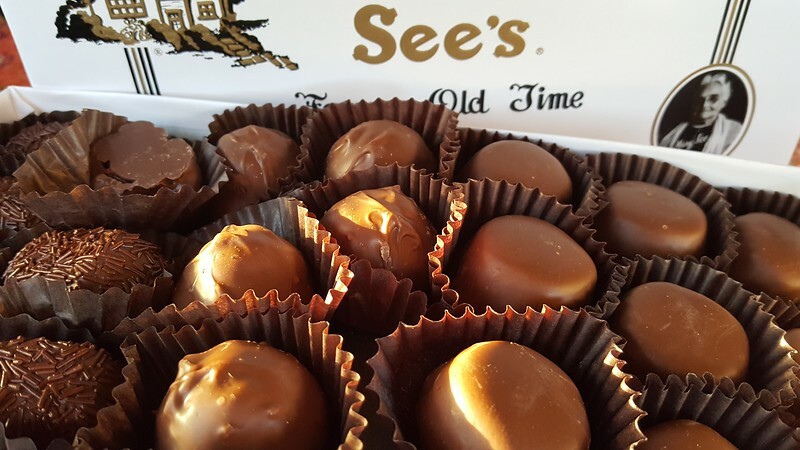 We have a tradition to buy some happy See’s Candy to share as a Valentine’s Day treat. Such decadence, but at least it is only once a year, or maybe twice if I get some at Christmas. I haven’t had chocolate as creamy perfect as See’s anywhere in the country, even at some of those fabulous artisan chocolatiers in trendy little tourist towns. Redding RV Park isn’t fancy, but it is right next to the freeway, and if you get a nice long site on the rows farthest from the freeway it is quiet enough for a good sleep, with space to pull through. What the very nice looking website doesn’t show is that much of the park is on a fairly steep hill overlooking the freeway. In all fairness, the actual sites are decently level, at least most of them are. We called ahead for a reservation as soon as we were sure of our route, and it was again a good thing that we did. The park filled up after dark. The next morning dawned clear and gorgeous, with Mt Shasta looming in the north to mark our route home. We again took our time, filled up with gas at the station around the corner from the park, (also the cheapest gas in Redding),and got on the freeway. Yes, it was I-5, but between this part of California and Oregon there are no other real options. 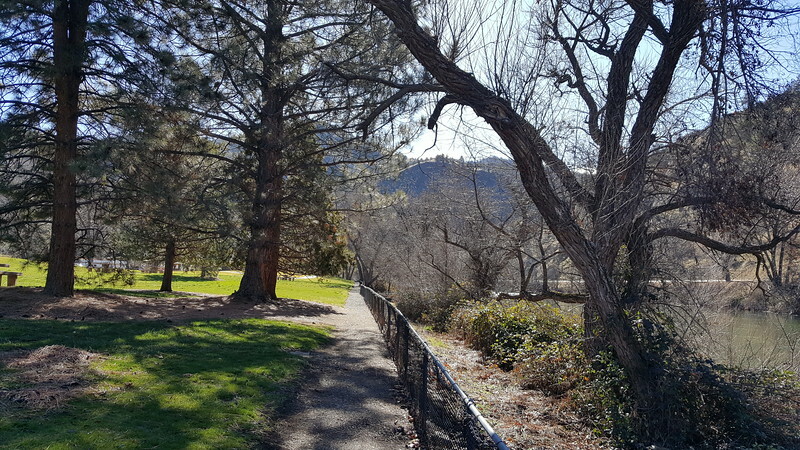 For the first time in a long time, we stopped at the rest area north of Yreka that is down in a canyon along the Klamath River. It is also a California Welcome Center with a docent offering information about both California and Oregon, some lovely art, maps and tons of brochures for things to do in both Oregon and California. 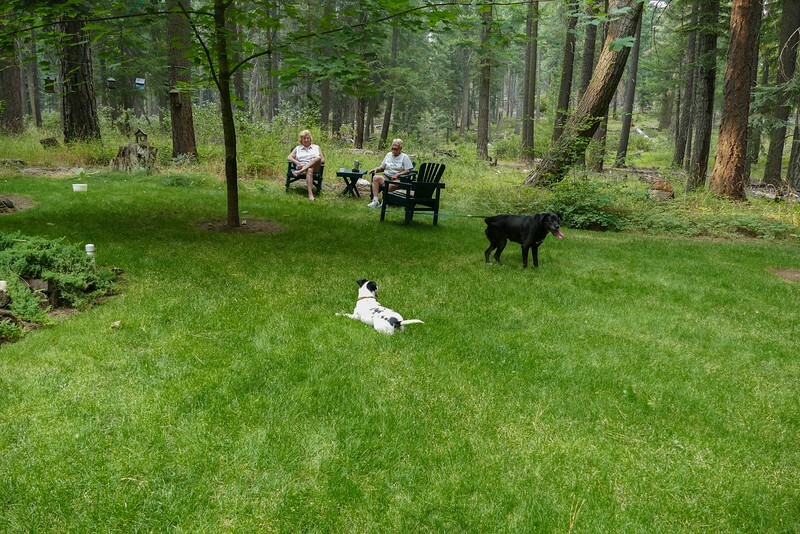 We enjoyed the sunshine and the river and Mattie loved the spacious unfenced pet area. When we pulled into the driveway at home in the early afternoon, the sun was shining, and we were both still fresh and energetic enough to empty the MoHo and start the laundry. A perfect travel day at the end of a rather amazingly perfect trip. Love to travel and love to be home. I am so glad that we can do both. 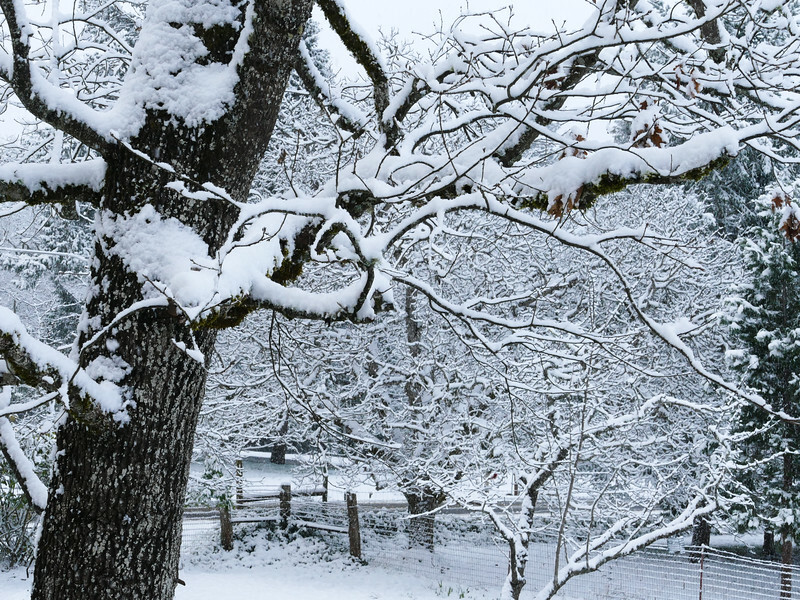 Our timing was perfect, because in just a few days winter decided to come to Grants Pass after all, and we had real snow right here at home. 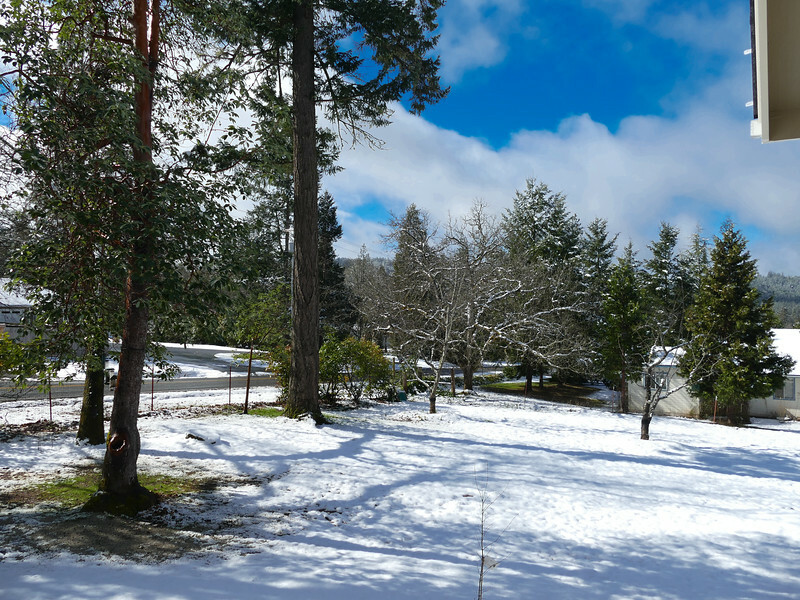 That doesn’t happen often in Grants Pass, and this time as well the snow melted with the afternoon sunshine. Tucson. Even the name has a bit of a romantic ring to it. I will always associate it in my mind with one of my favorite books by Barbara Kingsolver, “Animal Dreams”. I imagine the heat before the monsoons come because of the way she described it, not because I have actually lived it. I imagine coyotes in the washes and the wet dust smell when the rains hit the dirt and flood the washes. Barbara Kingsolver left Tucson behind for a more sustainable life in Appalachia, her original homeland, but I will always think of her as a product of the Southwest, just because that book and “Pigs in Heaven” were the first books I read that she wrote. Our friends love living in Tucson, or maybe love-hate I should say. They say the summer heat is almost unbearable, and for a moment they thought about relocating to the Hill Country of Texas, but it was hot there as well, and humid, and a LOT more expensive. 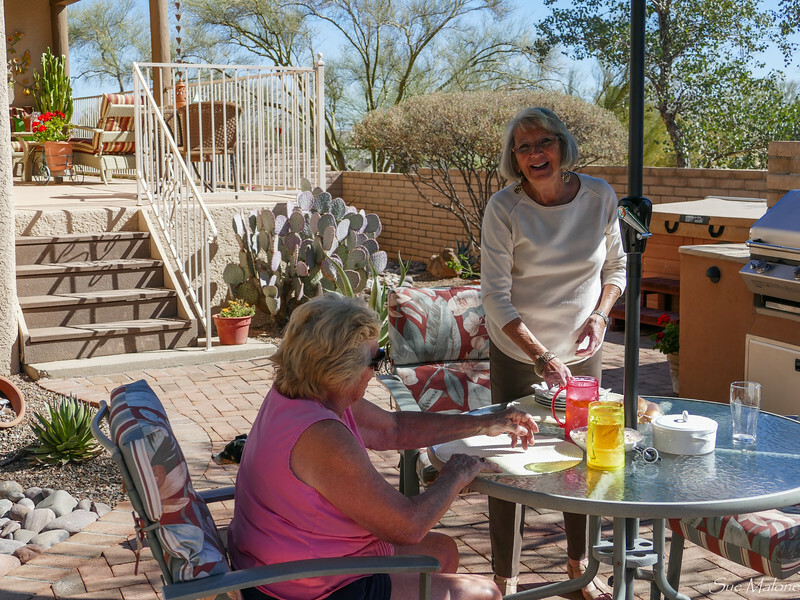 Still, the early mornings even in summer are beautiful and the evenings give them the opportunity to enjoy their shaded porches.They love the monsoons, and would always drive back to Tucson from Rocky Point in time for the big rains with amazing skies. 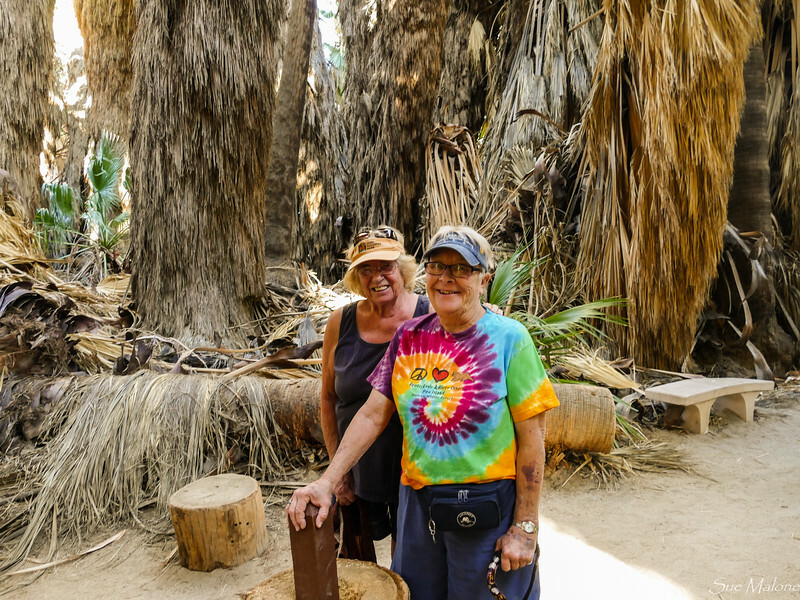 Their beautiful desert style home in the suburb of Sauharita looks toward Madera Canyon and there is a wash in their back yard that is home to many critters, although Wes said that there are fewer humans creeping through the wash than they saw a few years ago. 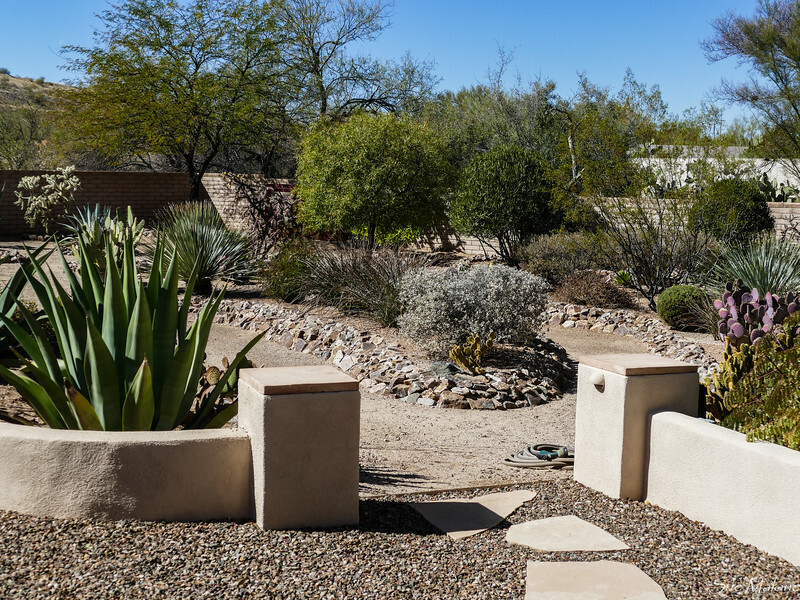 Their gardens are walled and manicured, planted for 15 years now with desert plants, cactus, and mulched with rock and gravel. Wes is meticulous and his gardens are beautiful. On our first day visiting with the two of them, we sat outside in the sunshine at the umbrella shaded patio table and had another one of Gayle’s glorious meals. Gayle can take anything, even simple store bought pulled pork, and make it seem as though you are dining in a fine restaurant. Lovely dishes, beautiful presentation, little condiments to accompany the meal. I try to emulate Gayle quite often when I make dinner for someone. 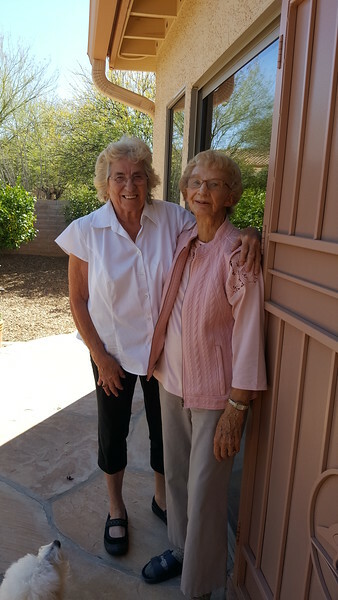 Mo’s long time friend Joan, who once lived in the Bay Area of San Francisco when Mo lived in Monterra, has relocated to Tucson in her retirement as well. She and her husband settled in to Green Valley, in an area insulated from so much, including any residents under 55. It is a beautifully manicured community, and now that Joan is without Joe, she says it is a perfect place for her to be in her 80’s. 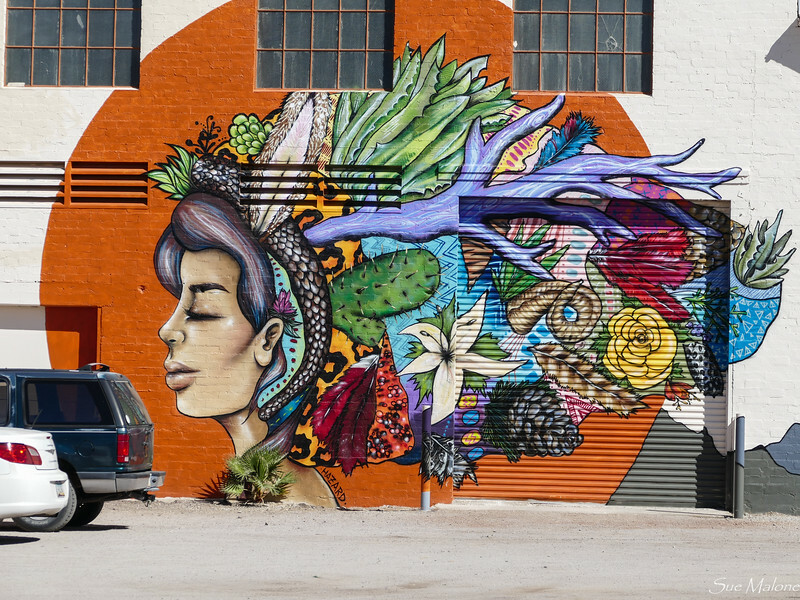 She loves the heat, loves her desert garden, her life and her community. We travel to Tucson to be with these friends, not so much to visit Tucson. There are some amazing things to see and do near and around the city, though, and each time we go it seems we find something new to enjoy. After lunch at Wes and Gayle’s, the four of us thought, “Why don’t we go to Tubac?”. We had been there in the past with Joan, but there was an art show going on, and I had a bit of an ulterior motive. 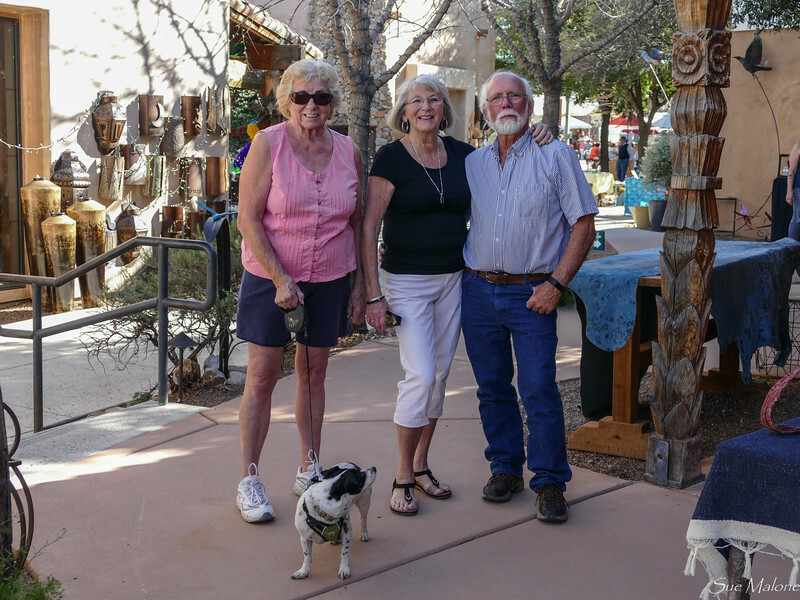 Mo and I were still cruising for some outdoor art pieces for the house back home, and Tubac is a plethora of all kinds of art, indoor and especially outdoor art with that colorful southwest bent. 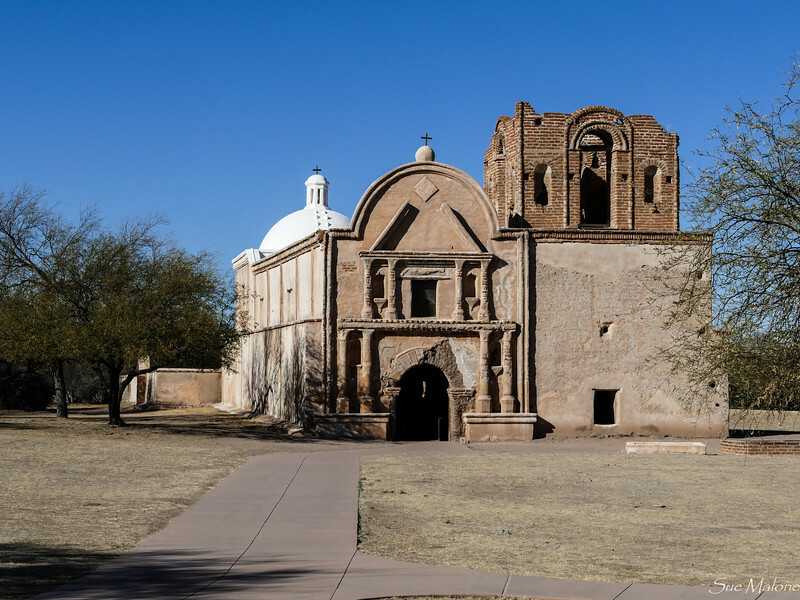 It was a warm afternoon, and even though the crowds were big, Wes found a place to park and we slipped into the paths and walkways meandering around the galleries and restaurants of Tubac. 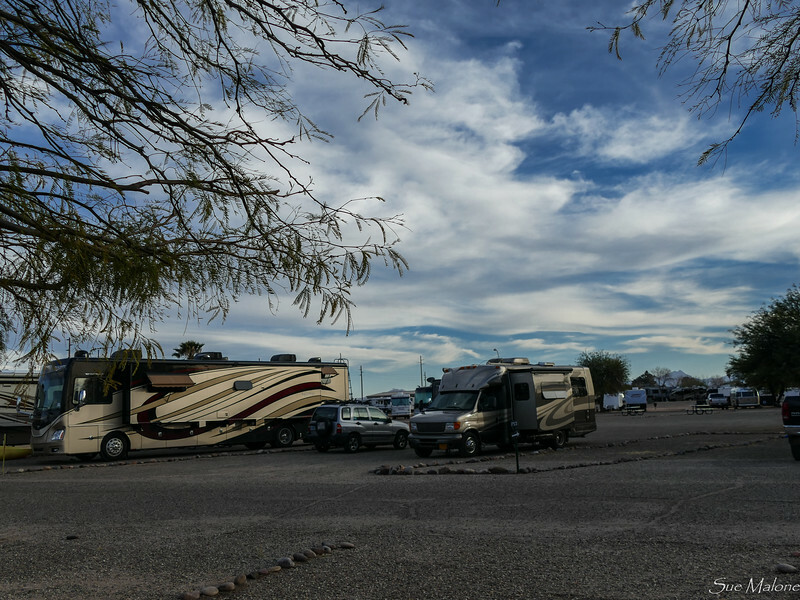 The area has been populated by humans for millenia, first by the mammoth hunters, then the Hohokam, followed by Pima and native O’odham, who greeted the Spanish when they arrived in the early 1700’s. The Jesuits built missions there, and there is an historic presidio in addition to the Tumacacari Mission ruins which we visited later in the afternoon. The galleries were wonderful, and with the addition of all the art booths for the juried show, we had lots of eye candy to peruse. I looked long and hard at several pieces for the house, but it was Mo who spotted the very best one on an upper exterior wall of Michele’s Gallery. We bought the sun sculpture, and Wes dutifully carried it back to the car for us. 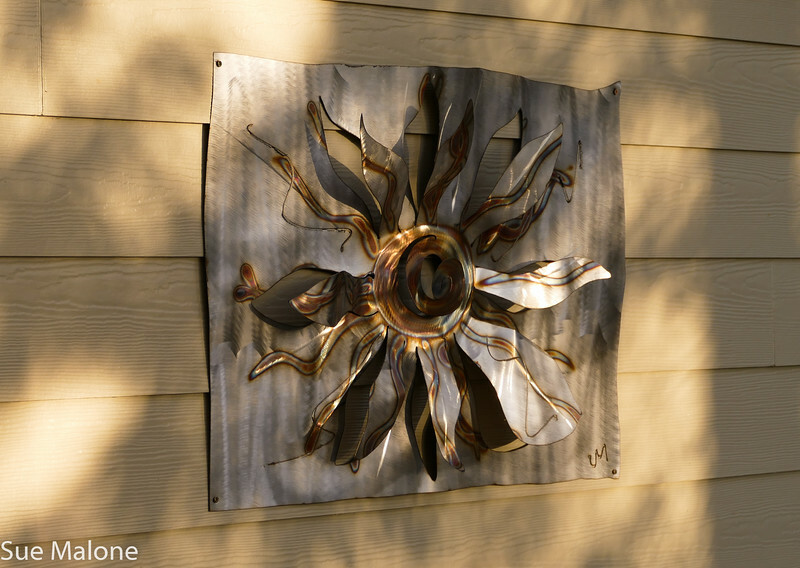 We also found a colorful metal sculpture of sunflowers, toned down a bit from the bright southwest colors, but still pretty for our home back in Grants Pass. Wes also carried that one back to the car for us as well. We took Mattie on a leash with her halter, and it was a bit challenging to say the least. So many little dogs! And of course she wanted to play with them all. Some of them she thought deserved a bark and she was really a pain in the neck. Mo spent a lot of time holding her in and scolding her. I think our big mistake was letting her play unfettered with the big old red bloodhound that lived near the apartments in Klamath Falls. He was her best buddy and would let her jump and climb on him, and drag him around by the lip. She didn’t have to learn manners playing with Red. Now she needs some manners and it takes constant attention. Wes drove south just a mile or so to the Tumacacari National Park, where the ruins of the Tumacacari Mission are protected. We entered with our geezer’s passes, and Wes offered to stay outside the walls with Mattie so that Mo and I could both go in the park, where dogs are NOT allowed. The history was fascinating, the stories were interesting, and the museum was very well done. 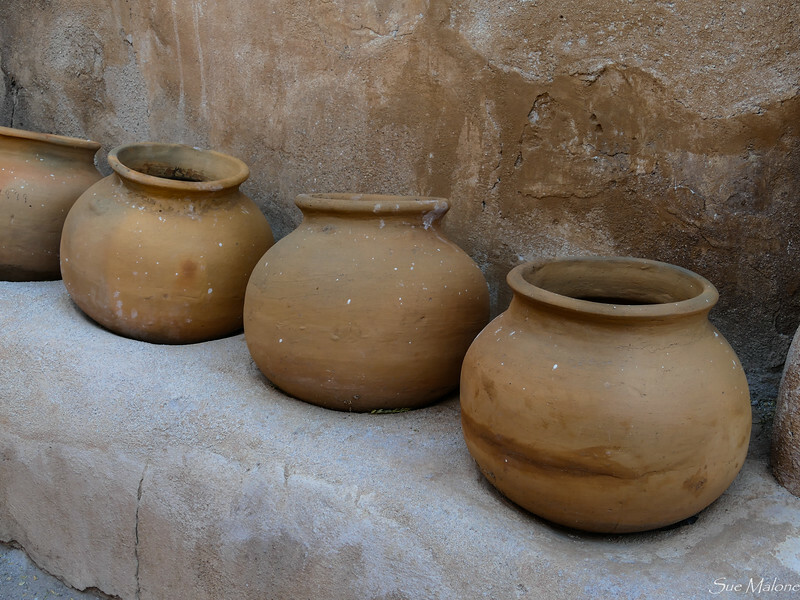 I loved the light and color of the old mission ruins, especially the grain storage jars lined up in the rounded impressions in the old adobe. Recreating what the past must have looked like is an interesting pursuit, and I appreciate that curators do that for us. That evening we returned to Wes and Gayle’s home for another meal, this time a fabulous dinner that was again one of Gayle’s masterpieces of flavor, color, and presentation, in beautiful dinnerware, with good wine, and yummy dessert, in their lovely dining room. Did I mention that it is always a treat to enjoy Gayle’s meals? We didn’t get back to our site at the base until very very late that evening. The next morning, we had arranged for them to meet us outside the gates of the base to drive up the Mt Lemmon Road. 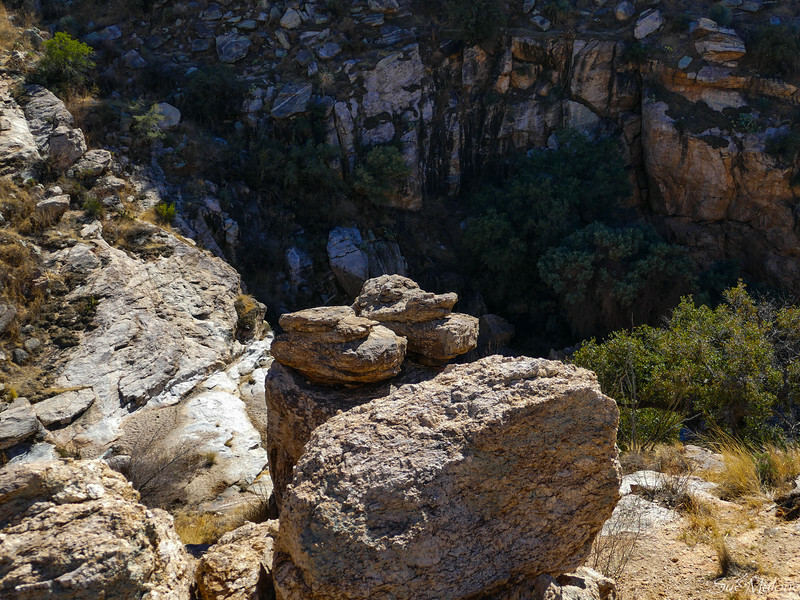 There were choices, including hiking Sabina Canyon, something that is on our list and will remain on our list. 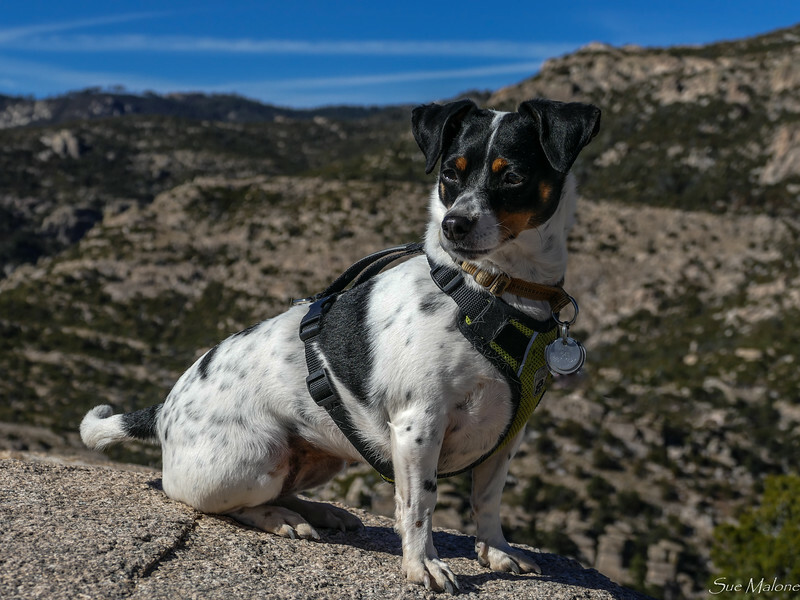 Madera Canyon is another place to hike, but we only had time for so much, and with the beautiful, clear weather, Mt Lemmon was our first choice. “Construction on the Catalina Highway began in 1933, owing in large part to the efforts of Frank Harris Hitchcock, former Postmaster General of the United States. As a part of the effort, a federal prison camp was established at the foot of the mountains specifically to supply labor for the construction of the highway. During World War II, the camp was converted into an internment camp named the Catalina Honor Camp, and the internees were forced to work on construction of the roadway. One of the Japanese American prisoners at the camp, Gordon Hirabayashi, was later honored in 1999 when the site of the Honor Camp was converted into the Gordon Hirabayashi Recreation Area. The highway would not be completed until 1950, 17 years after it began. Upon its completion, the highway was named after Hitchcock, who had died in 1935. The road is still winding and narrow, but there are several campgrounds and trailheads along the route that we explored a bit. 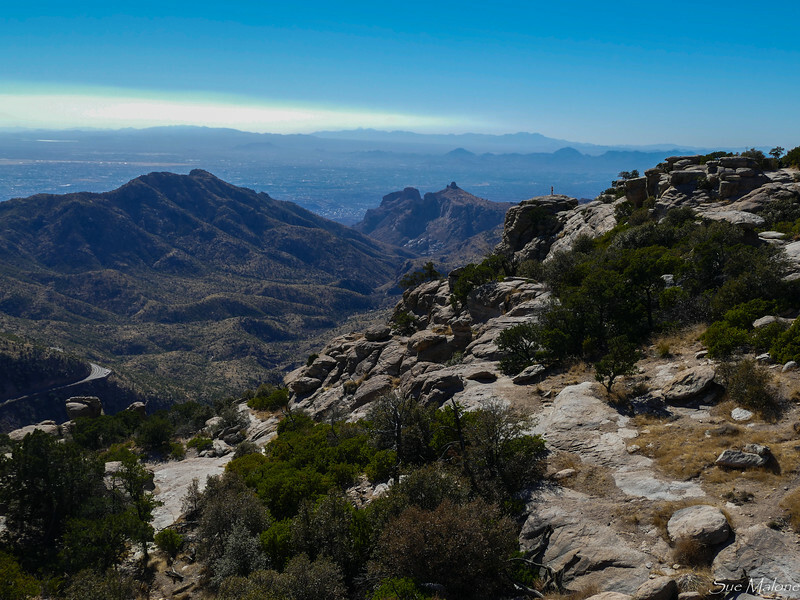 Most of the trailheads are much like other hiking trails in the Catalina Mountains, very steep and very rocky, at least the parts that we could see without actually hiking them. My favorite part was the magnificent view from the overlook area with stone walls, and pathways, old rock restrooms that were a bit like the CCC buildings, and open well worn trails that led to the best viewpoints. 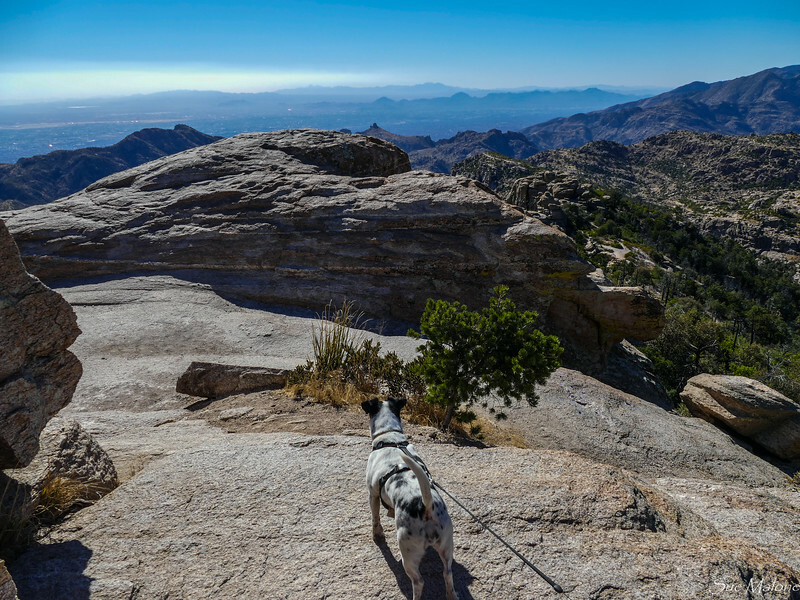 It was thrilling to look out over the canyons and mountains from the weathered granite boulders that formed this famous “sky island” in the desert. 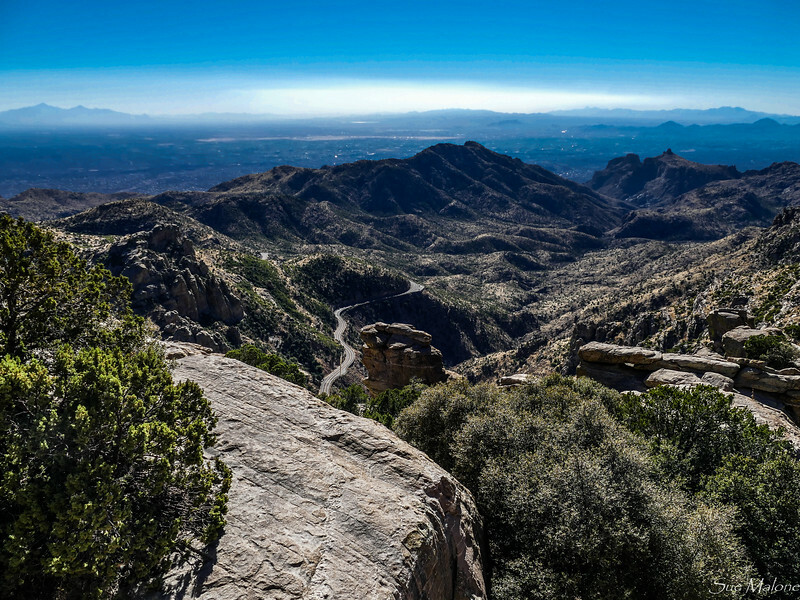 The Chisos Mountains in Big Bend are another example of this typical southwest landscape of mountains rising above the desert surrounding them and supporting a completely different array of plants and animals than are found at lower elevations. After our day of touring, we settled on dinner for the four of us at the Texas Roadhouse on Broadway, not far from the base. The food was good, but oh my, the noise! It made it very hard to relax and enjoy our meal, much less have any kind of conversation. I don’t for the life of me understand this trend for big noisy restaurants. Gayle and I decided it makes you eat faster and talk less because you get all wound up inside and a bit frantic. We spent Saturday visiting with Joan before returning to the base to dump tanks, take on water, checking everything in the MoHo, and taking long showers. We wanted to be sure we were ready for our Sunday morning exit north from Tucson. Sometimes on our southern sojourns there isn’t enough time. On this trip, however, we made sure to get all the way south to Tucson. 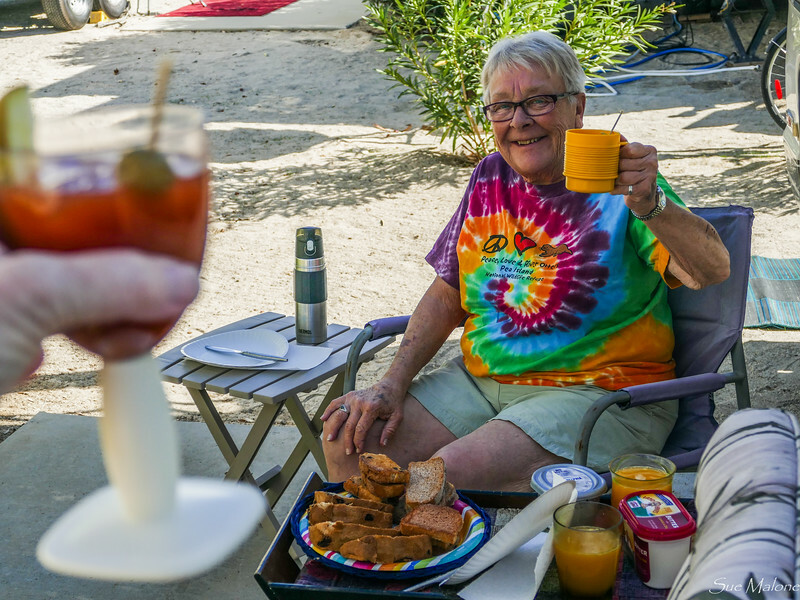 We missed our friends and neighbors, Wes and Gayle, who used to live in Rocky Point at least part of the year, and are now located full time in their beautiful desert home in Sauharita, south of Tucson. We have visited them a few times, but it has been a couple of years and we looked forward to sharing some hikes and good food with them. But first, we had to pick a travel route. That was easy. 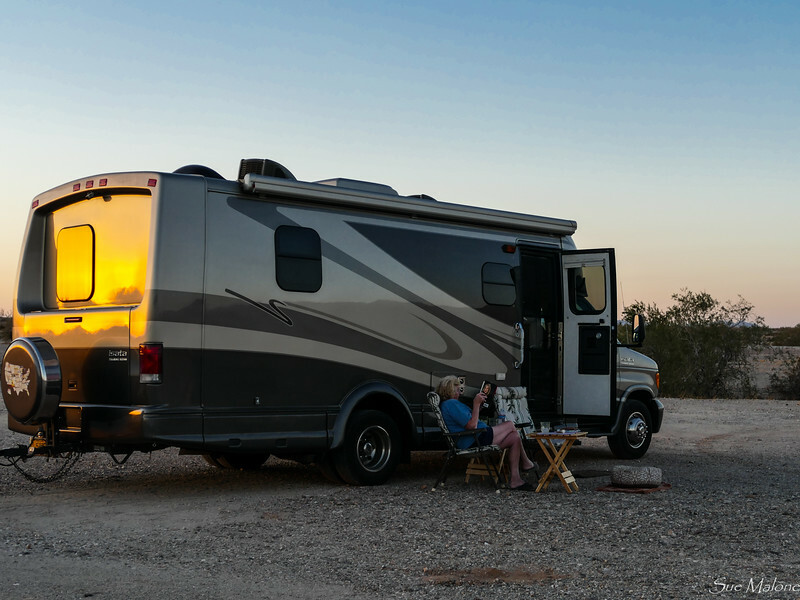 One of our favorite boondock sites in the southern desert is the wide open BLM area near Ogilby Road, just west of Yuma. Lots of fellow bloggers have landed in these open spaces at one time or another, but I think the first time I heard about Ogilby Road was from Nina, at Wheelin’ It, who wrote some very lovely poetic lines about the place and took intriguing photos that sucked me in. 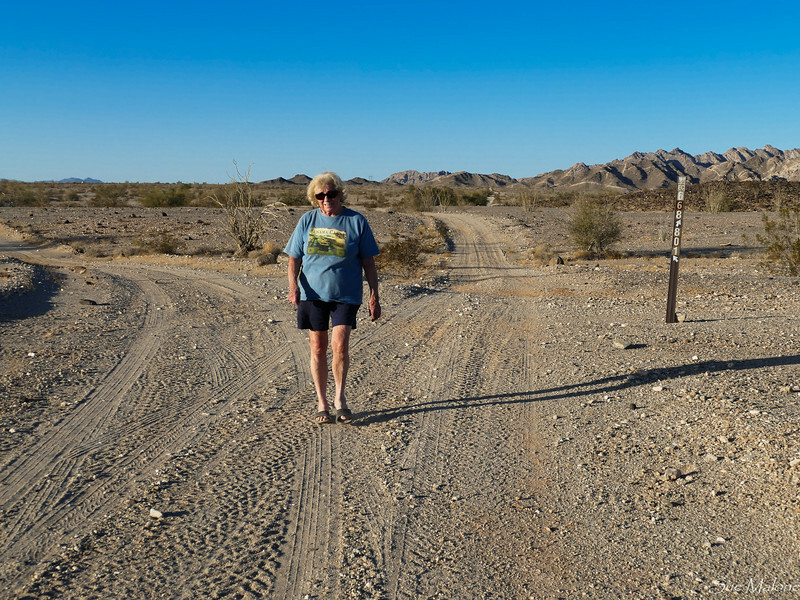 Our first time here in 2014, we came in from the south, but after George and Patsy talked about a back route between El Centro and Ogilby Road, we decided to give it a try. With our 26 foot rig the road was a lovely ride, driving past the Imperial Sand Dunes. 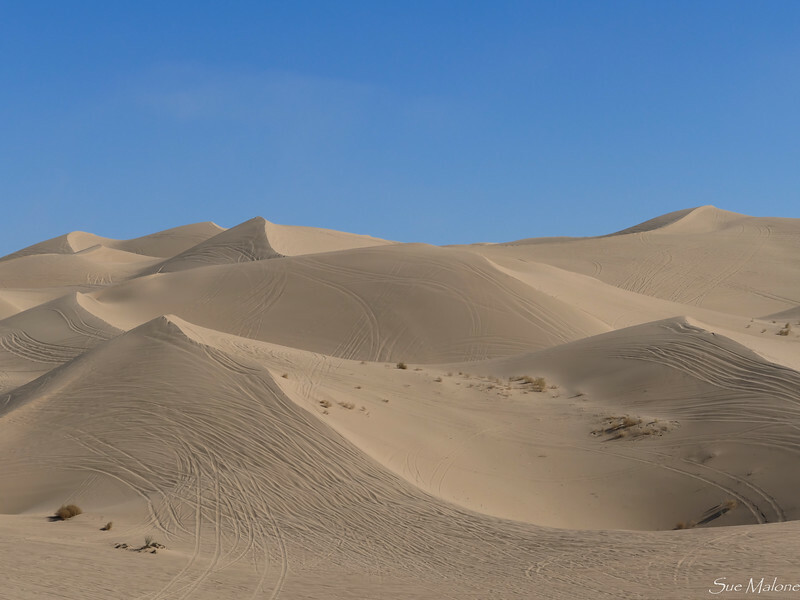 The dunes were quiet on this Tuesday, but the tracks on the sand showed just how busy they must be much of the time with 4 Wheeler’s running about. Google Maps tried to insist that we take a short cut to Ogilby Road, and we said, no way, it was a bumpy dirt road and we could see that the real Ogilby Road wasn’t too far east from where we were. I told the google girl to stop talking and we found our own way in from the north. 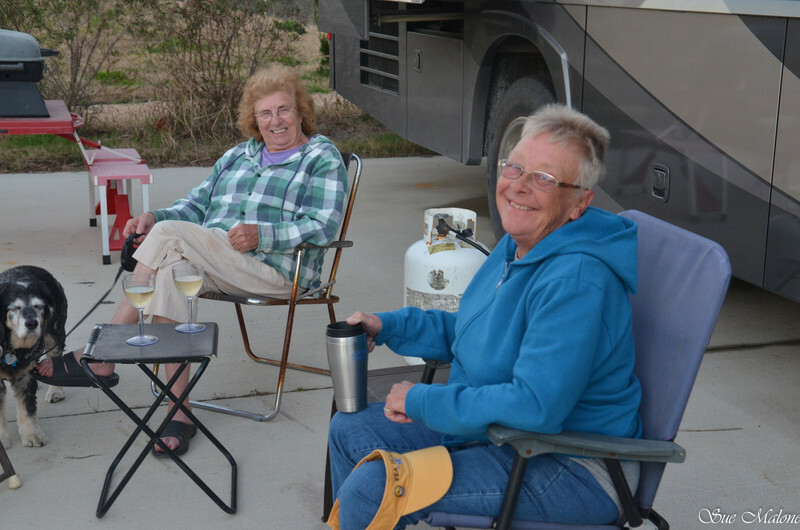 We found a great wide open spot, not far from the hills toward the northern end of the main boondocking area and settled in quickly. We set the chairs out in the cool shade and read, took the dog for some walks, and simply enjoyed the incredible silence of the desert as sunset approached. I could stay out here for a lot longer than a single night, but it really was just a pass-through for us this time, and a pleasant one. Only problem for me is that when we are boondocked in the desert like this, I have to get up repeatedly during the night to check out the stars, the darkness, and the silence. Incredible. The next morning we took our time with a good breakfast, a nice walk, and an easy pack up, since we hadn’t unhooked the Tracker, and didn’t even need to drop our jacks on the level desert floor. We simply pulled in the slide and drove off. The eastern route toward Tucson is fairly straightforward along Interstate 8 until it intercepts I-10, but that also seemed a bit boring. Instead, at Gila Bend, we turned south toward Ajo, a place we have heard about often but we haven’t been there in the MoHo. Many years ago, Mo traveled to the Copper Canyon train, and their tour came back through the US near Organ Pipe Monument, and Ajo. 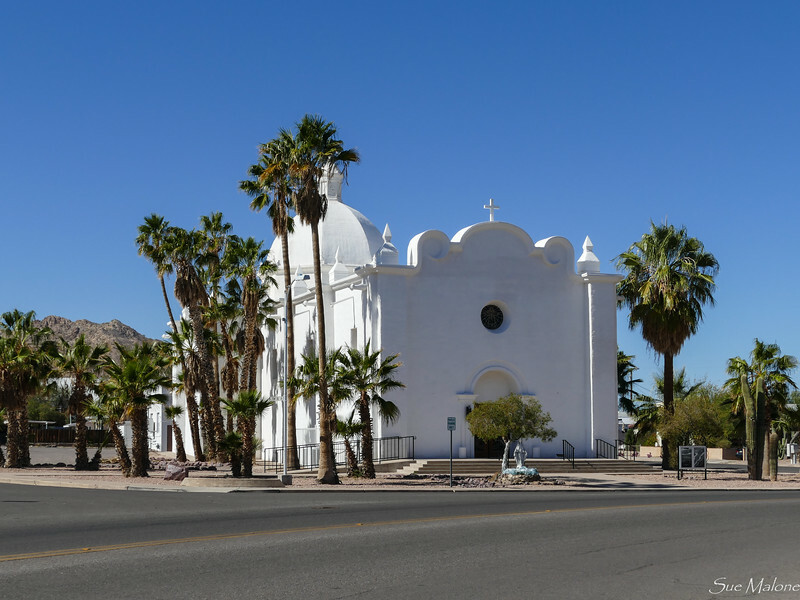 We were heading for Organ Pipe, but were so enchanted with the little town of Ajo that we spent all our free time there and had to skip the side trip to see the monument. Next time, I hope. I still love seeing photos of this place. We have friends who have a house in Ajo, but they are currently in Rocky Point. 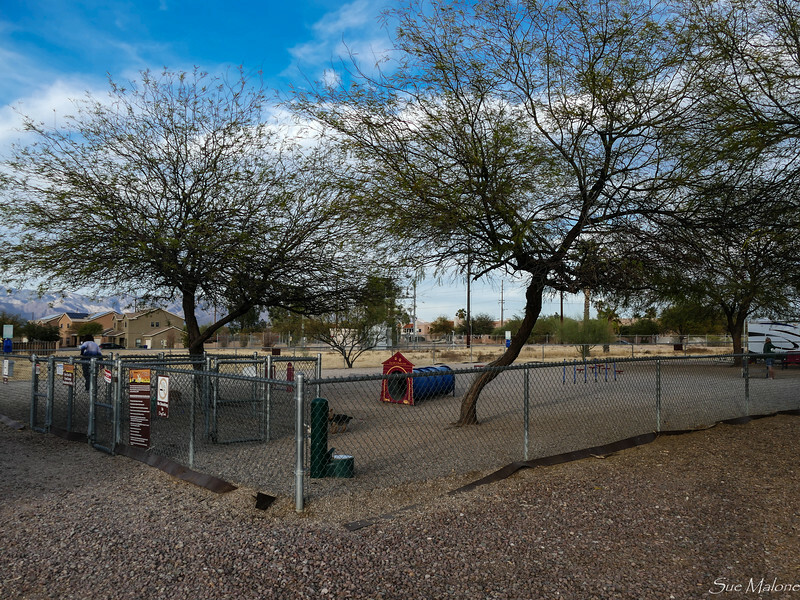 Judy once had a house in Ajo, and we always wondered why in the world anyone would live there. After visiting, we now understand. 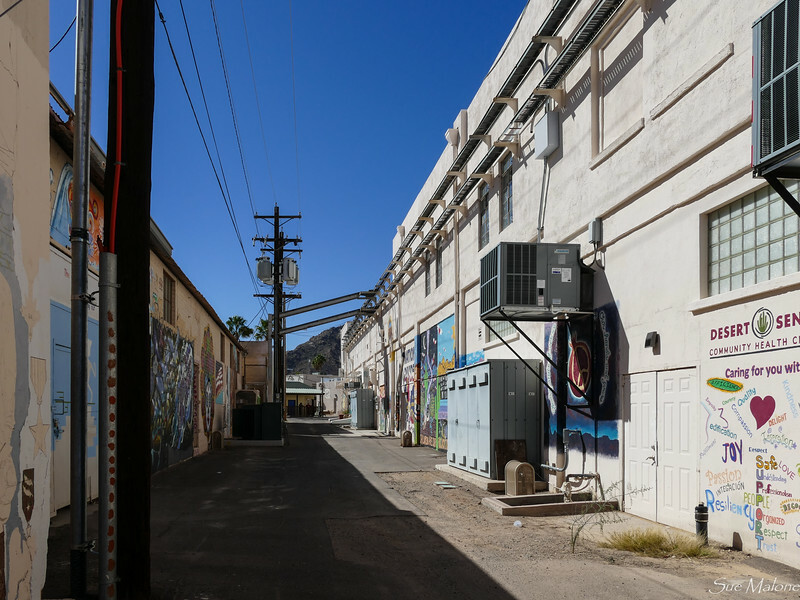 It is a quirky, artsy place, with cute little funky stucco houses that sell for $69,000 or so. 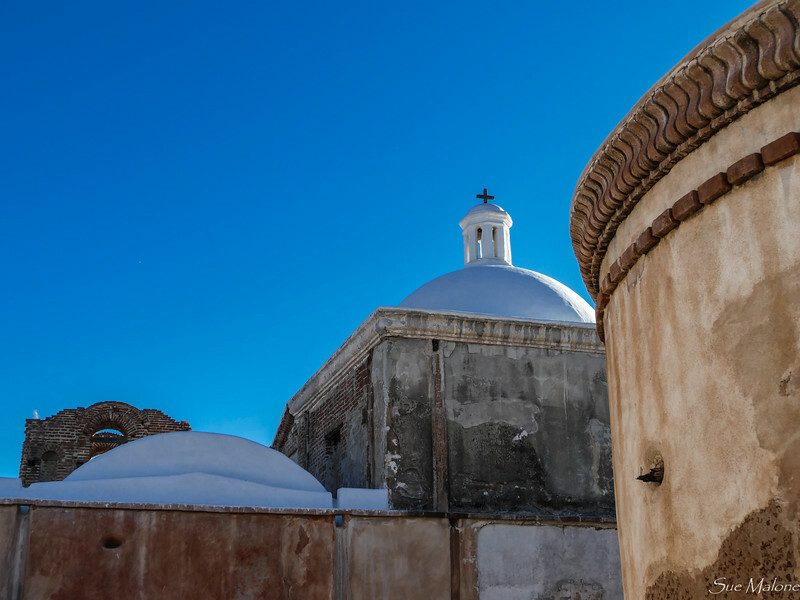 There are some galleries, a few stores, a great museum, and some gorgeous churches and buildings. We loved the artist alley with murals lining both sides of the street. We both said having a little house in Ajo would be a fun way to spend winter time in the desert. But no, we have the MoHo, and we don’t need another little house anywhere! Continuing east toward Why, we passed Darby Wells Road, another well documented site for boondockers. Would love to explore that one someday as well, but our friends were waiting and we needed to get on to Tucson. We also passed the road leading south toward the Buenos Aires National Wildlife Refuge, where RV Sue and her crew were camped for a couple of weeks. Those mountains along the western edge of the refuge looked really inviting. We passed Kitt Peak, where google was kind enough to answer my questions regarding the huge observatory at the summit. I guess the next time we go to Tucson it might be fun to take a trip up there to see the huge solar telescopes. 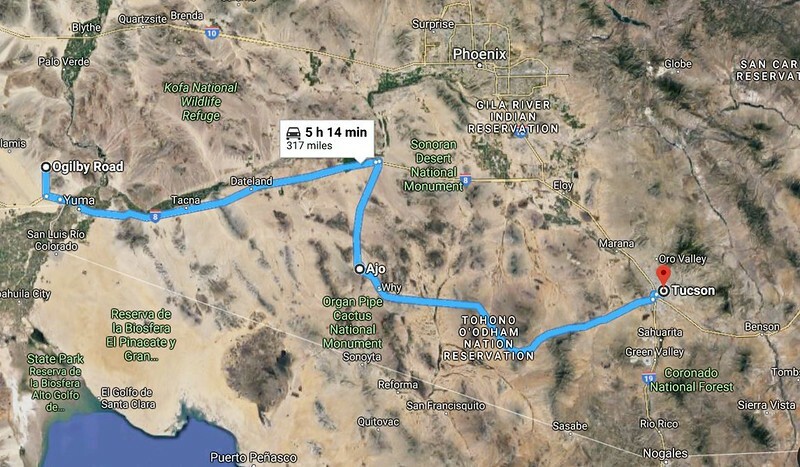 All our extra sightseeing delayed our arrival time at Davis-Monthan AFB to just after 4:30 PM, (we lost an hour to the time zone change). We were delighted to see that the office was still open, but not so delighted to discover that the Family Camp was completely full except for the overflow area. Overflow sites are $11.00 per night, and are the only way to eventually get into the full hookup portion of the camp, since there are no reservations. The office people told us it was a 6 to 10 day wait for a site. Hmmm. 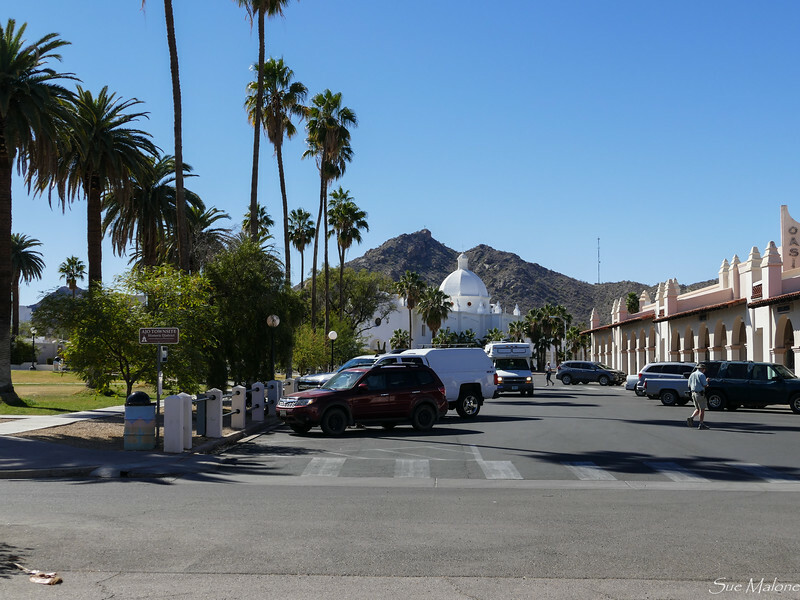 At first we thought about just paying for 1 night and looking for a park somewhere, but were discouraged by the information that almost all the parks in the Tucson area were full, thanks to the famous Tucson Gem Show that was in full swing. 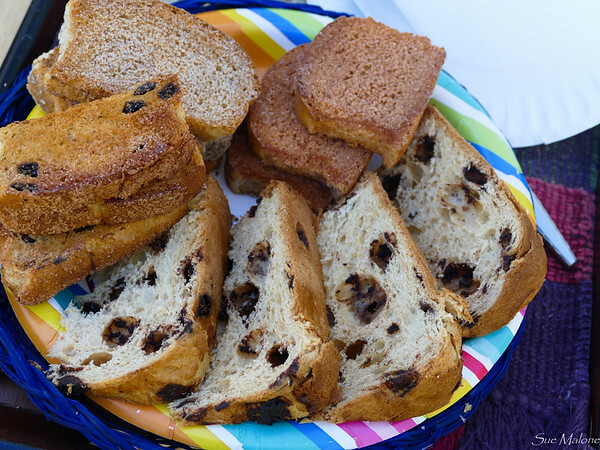 What the heck, we decided that dry camping for the four days we expected to stay in Tucson would be a piece of cake. We had full access to all the amenities. 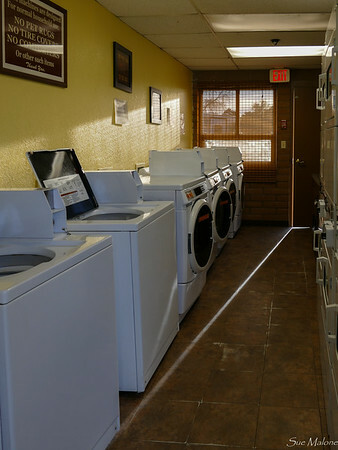 The laundry room with the cheapest and best machines on the road was just a hop from our rig, the bathrooms as well, with their nice big showers and hot water. 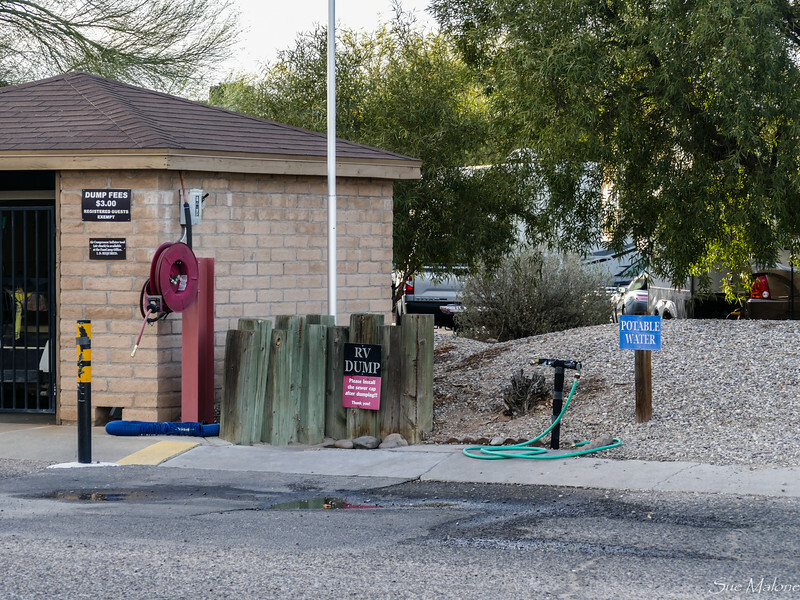 There was an easy dump site with air for tires, and potable water where we could take care of the necessities with a simple drive around the block. There is free coffee and cappuccino in the camp office, HD TV and full computer hookups with direct access. Does anyone carry cords for direct card access any more? We had terrible Verizon service, however, and that was a big surprise. Verizon was fine elsewhere in the area, but at the base and nearby it was 1 sketchy bar. We haven’t popped for any kind of boosters since we aren’t on the road all the time and have managed to do without, but it did get a bit frustrating while we were there. 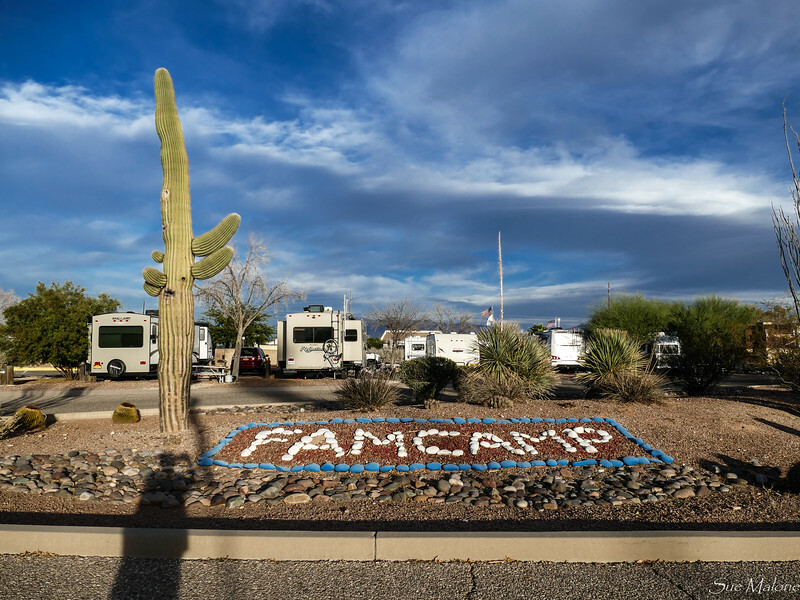 We do love the family camp at Davis-Monthan. 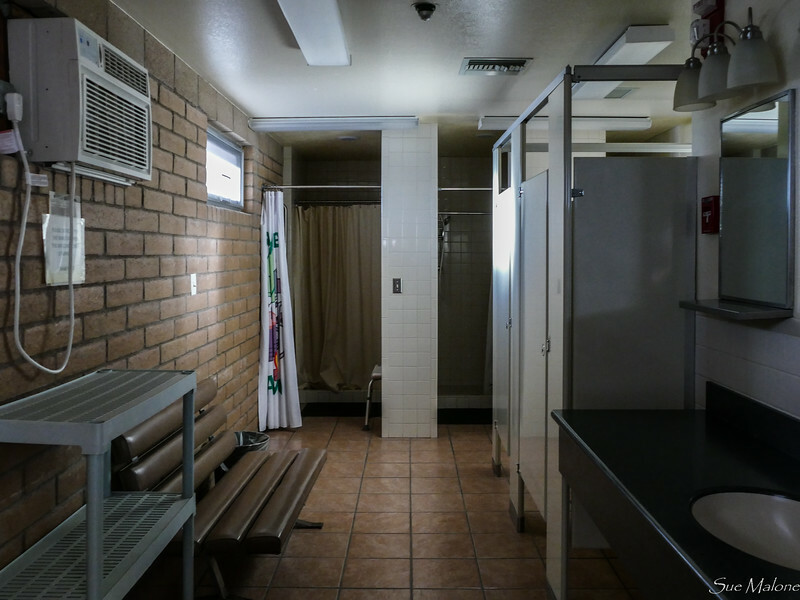 It is clean and well maintained, and the base is big and has a great commissary. Mui would love it, Erin. There is a golf course, a movie theater, good gasoline prices at the on base station, a fitness facility and a pool. We never have any time to really partake of all the stuff, but we did enjoy the dog park for Mattie, right outside our door. In fact, we decided that dry camping at DM AFB is pretty darn nice, with the sites being spacious and much more roomy than the somewhat close sites in the main park area. 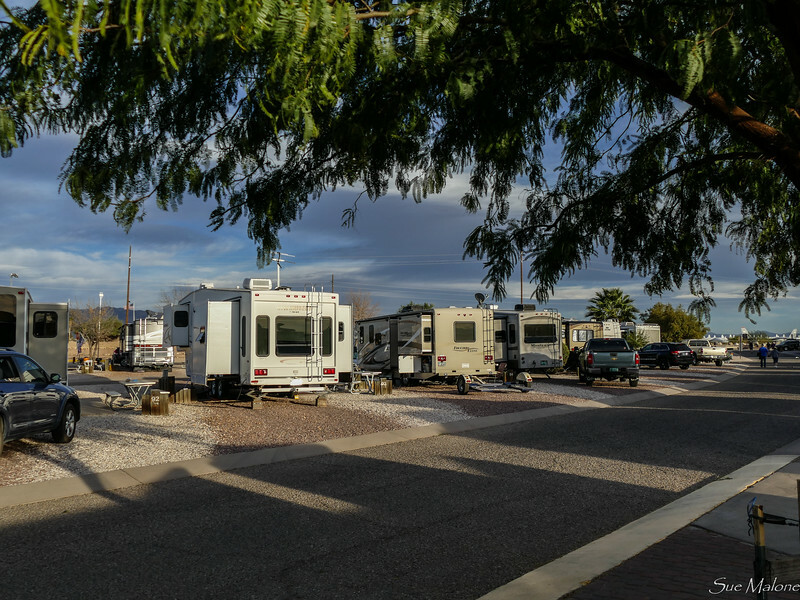 I think next time we come to Tucson, we will simply plan on dry camping and enjoy the openness and not bother paying the $22.00 per day for full hookups. We knew the next few days were going to be filled with fun and friends, so enjoyed a bit of down time. The generator only ran for a couple of hours so that I could process photos. I did manage to keep photos processed on this trip, but didn’t even think about trying to upload them to SmugMug until we were safely back in Oregon with our full cable unlimited WiFi. It certainly helped when I got back home to only have to do the writing without having to do all that photo processing as well. 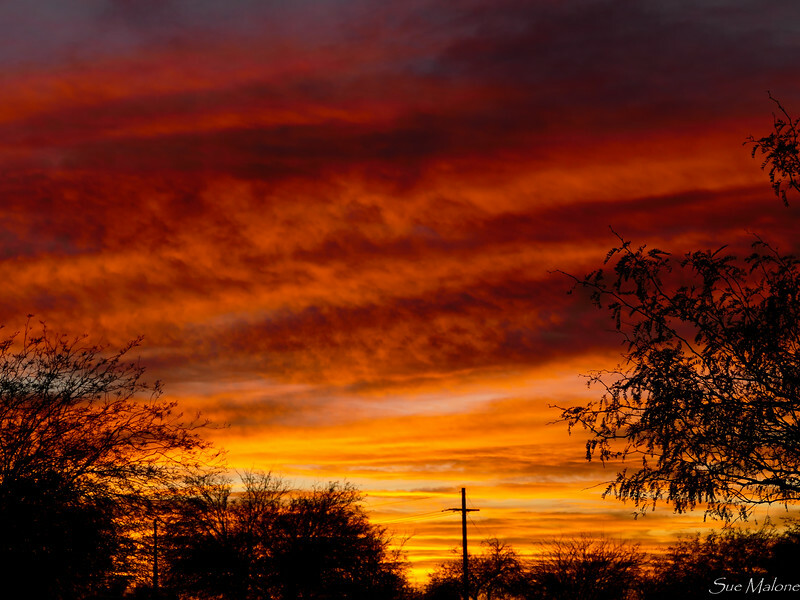 We spent the next few days with our friends, enjoying the dog park and walking with Mattie, and being treated to some of those fabulous Arizona sunsets. 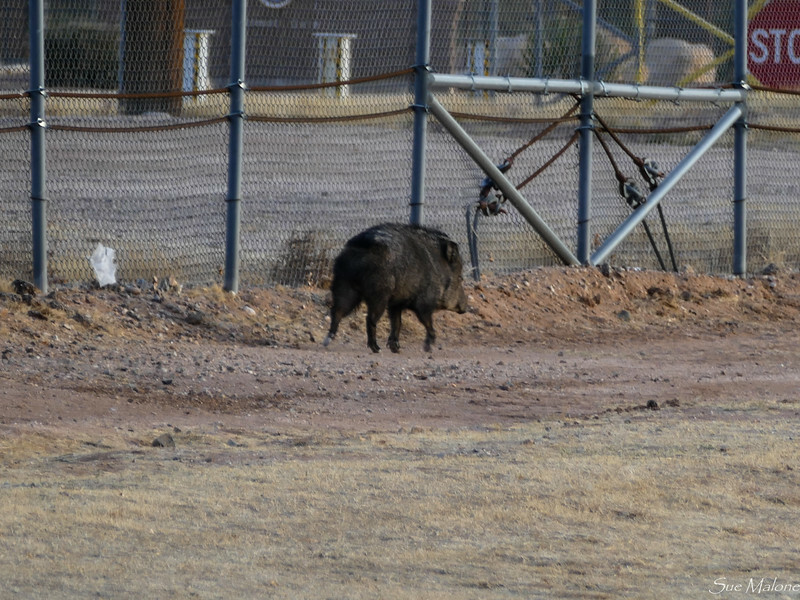 We even had an evening visit from a wandering javalina, who seemed to know exactly where he was going. Does this qualify as a “the end” photo? I think most bloggers that read my blog know Judy, either in person, or from her very popular blog, Travels with Emma. Everyone called her the Bird Lady of Blogland, with good reason. Judy spent ten yeas of her life traveling from refuge to refuge across the United States, volunteering. Judy is especially good with the birds, being responsible for doing extensive bird counts on many refuges. We first met Judy on our southern trip to Florida, stopping at Anahuac NWR for a visit. The story of my kitty Jeremy and Judy’s dog Emma meeting was a good one. 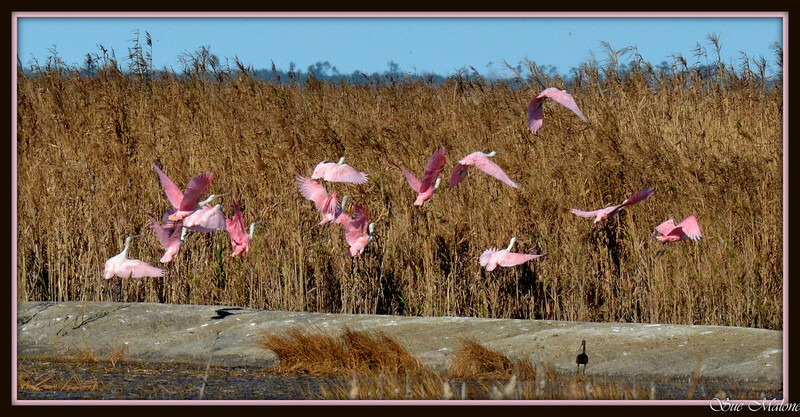 On that trip, Judy took us on a private tour of some of the hidden places at Anahuac, and I saw my first roseate spoonbills in person. Gorgeous day. Since then our paths have crossed a few times, with Judy visiting us at our home in Rocky Point, us visiting Judy when she volunteered at Harris Beach, and a visit to her home base now in Jojoba Springs. Judy hung up her blogging hat a couple of years ago, but in spite of her quiet absence, we managed to stay slightly in touch. I was thoroughly tickled when Judy called me last month asking about when we planned to be at Desert Hot Springs. We shared dates and plans, and got caught up on Judy’s new life at Jojoba. The big rig that she never really loved to drive is now gone, and in its place is a nifty new….not park model. I can’t remember what you call it, but technically it isn’t a park model because at Jojoba you are required to have a holding tank. Anyway, it sounds lovely, and Judy’s stories of her life and community at Jojoba were good to hear. But you know how that travel bug gets to us if we are stationary for too long. 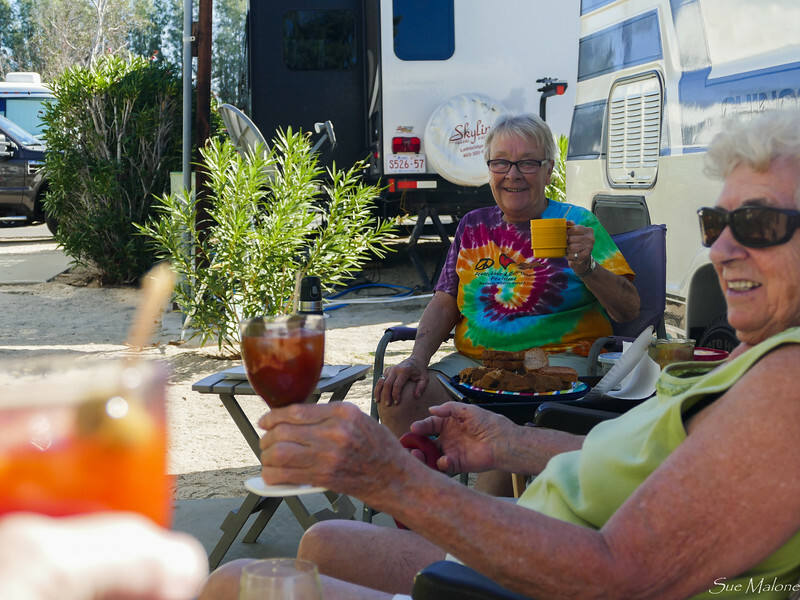 Judy found a sweet little Chinook Class B and wanted to try it out with a visit to Desert Hot Springs, and decided to stay at Catalina Spa where we could spend a bit of time together. She arrived late in the week, and I made supper for us to share inside the MoHo since we didn’t have an outdoor table big enough for all the fixin’s. The next morning, Judy invited us over for a Sunday brunch, with the best Bloody Mary’s I have tasted in a long time, and some breads from the Upper Peninsula of Michigan. It was Super Bowl Sunday, and without following football this season, we decided it was our last chance to get to the movies in Palm Desert, and Judy joined us. We sat in those great big comfy recliners with our wine and popcorn to watch Darkest Hour. An excellent movie, and the wine was cheaper than the popcorn. 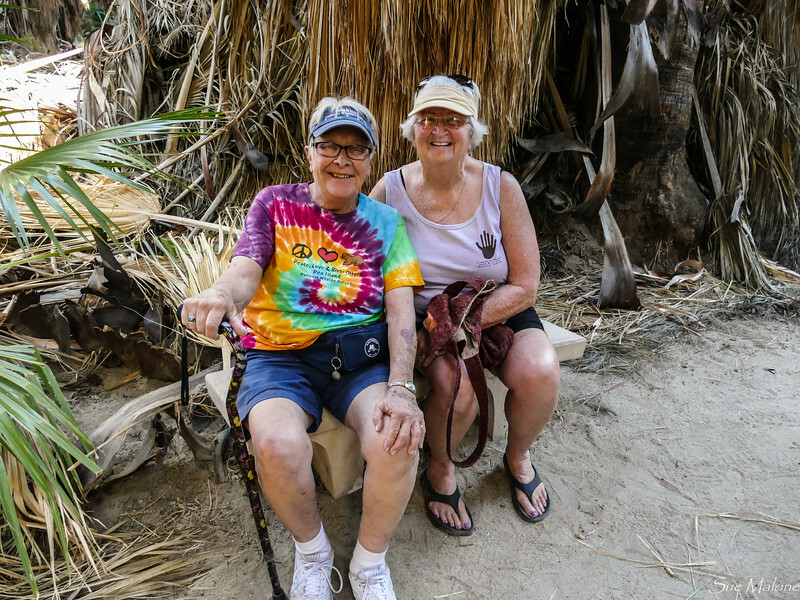 On Monday we left Mattie safe in the cool MoHo and took Judy to the Visitor Center and ponds at 1000 Palms Oasis. It wasn’t too crowded when we were there, and I think Judy enjoyed seeing the visitor center since she has so much experience with different centers at different refuges. Thousand Palms is a Nature Conservancy site with a great history, and there are some lovely hikes from the main area, but those were for another time. On Monday evening, Judy treated us to her dinner, “stuff” is what she called it. She said when her kids were growing up it was either white stuff or red stuff, and the red stuff we had was delicious. Patio time and conversation time as we both prepared to pull up stakes the next morning and head out in opposite directions. 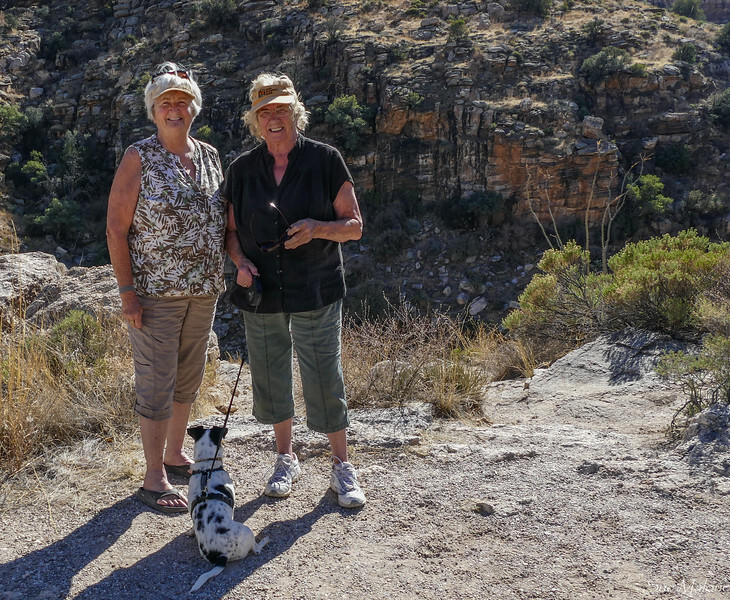 Judy back to Jojoba and Mo and I to one of our favorite desert boondocks on Ogilby Road. It was great to have some time to catch up, and to see that Judy is doing well. 01-29-2018 The Oranges are Waiting!